Did you find when you bought neapolitan ice cream that there was a favourite flavour that always went first? For us it was chocolate and then strawberry, but at a distant second. It was only when low on the others or when told off by the adults that we would eat the vanilla. Which is funny really because I love vanilla ice cream these days, although if given the choice I think I’d still choose the same order of preference. 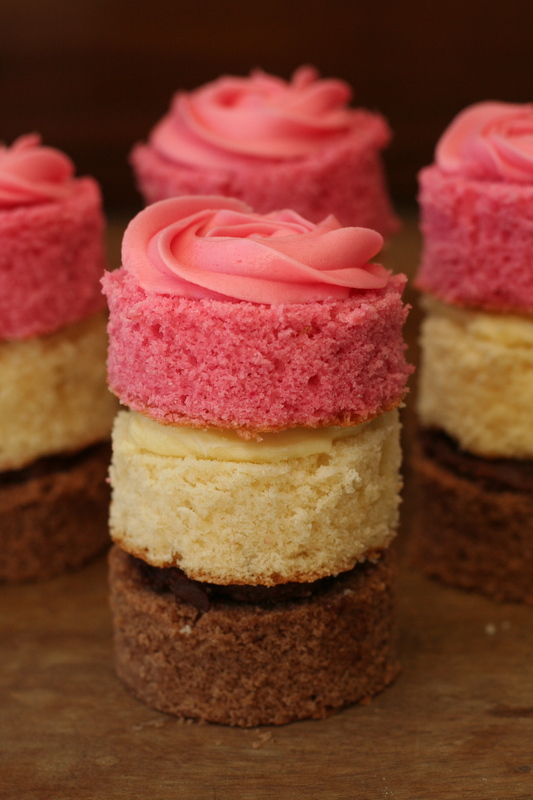 These miniature cakes bring together that classic combination of chocolate vanilla and strawberry so that you don’t have to choose just one. While you could bake each of these in individual moulds, to make life easier I baked 3 larger cakes and then use a cookie cutter to make smaller ones. You do end up with a lot of excess cake so I blitzed this in a food processor and combined it with the leftover frosting to make cake balls. You could easily make them into cake pops if you were so inclined. I wont write a full post for them but I will put a picture up on my Facebook page if you want to see them. 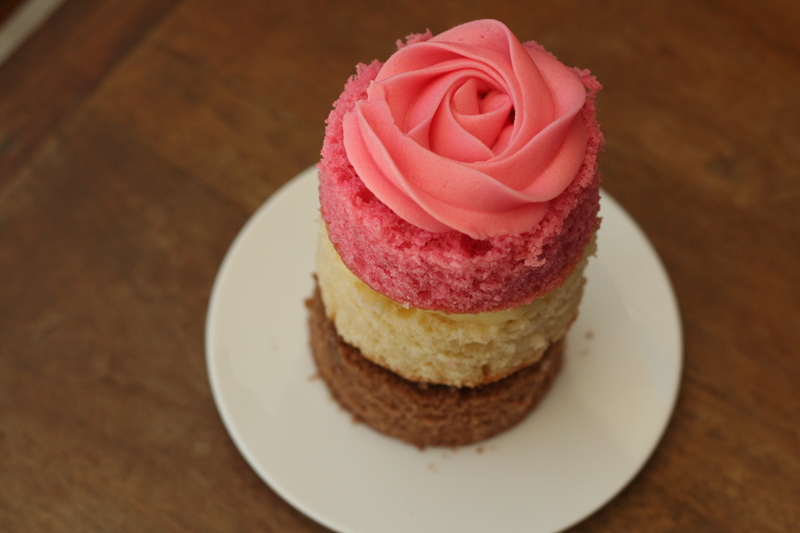 The cakes are dense and very flavourful with rich creamy frosting in between. I used the same frosting as in the cappuccino cupcakes but feel free to use buttercream frosting or any other that you prefer. 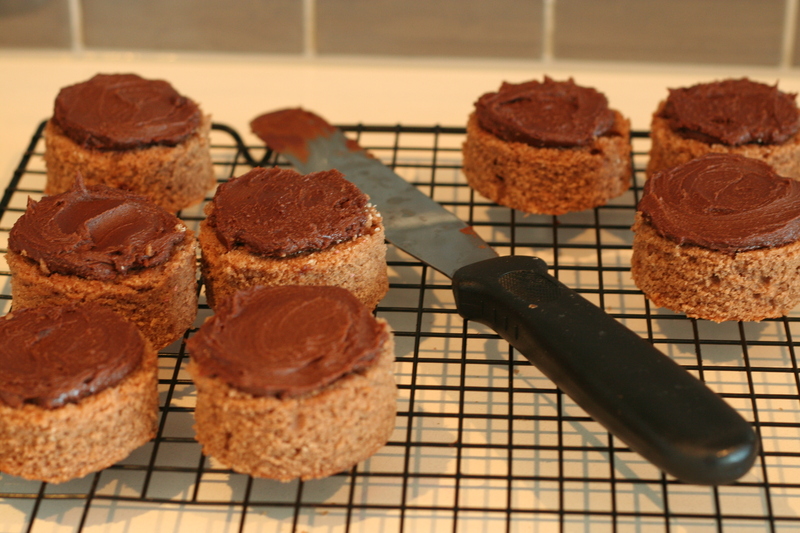 The cakes are made from one simple recipe with minimal variations. If you’d prefer you can substitute your own recipes but I’d try to keep them similar so each layer is as dense as the next. I took these cute towers of cake to an 80s themed birthday party over the weekend and they were a hit. Not that neapolitan is particularly 80s but it does evoke childhood memories which for many of us were from the right era. Being so tall it is hard to eat all 3 flavours at once (unless perhaps you use a fork) so it’s interesting to watch and see who eats what layer first. I haven’t quite decided which I like best so perhaps it’s time for another taste test! Preheat oven to 180° and prepare an 8 x 8 inch pan. Cream butter and sugar together in a large bowl. Mix in the eggs one at a time, beating thoroughly. Add the vanilla, baking powder and flour and mix until incorporated. Stir through the milk until smooth. Pour into pan and bake for 20-25 minutes or until a skewer inserted into the centre comes out clean. Combine 1/3 cup chopped strawberries with ½ tsp sugar and allow to sit for 10 minutes. Mix into batter with milk. 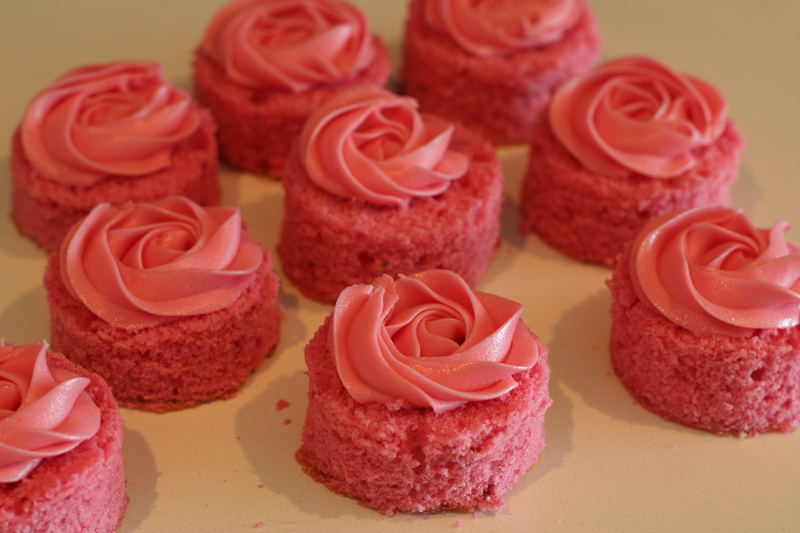 Add ½ tsp strawberry essence and a few drops pink food coloring to batter and stir through before baking. 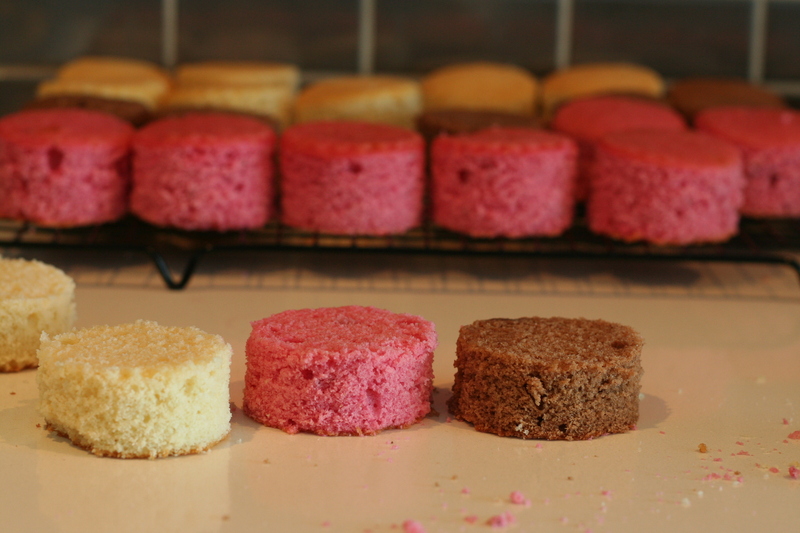 When all three layers are baked and cooled cut out small rounds of cake with a cookie cutter and level the tops so they’re all the same height. 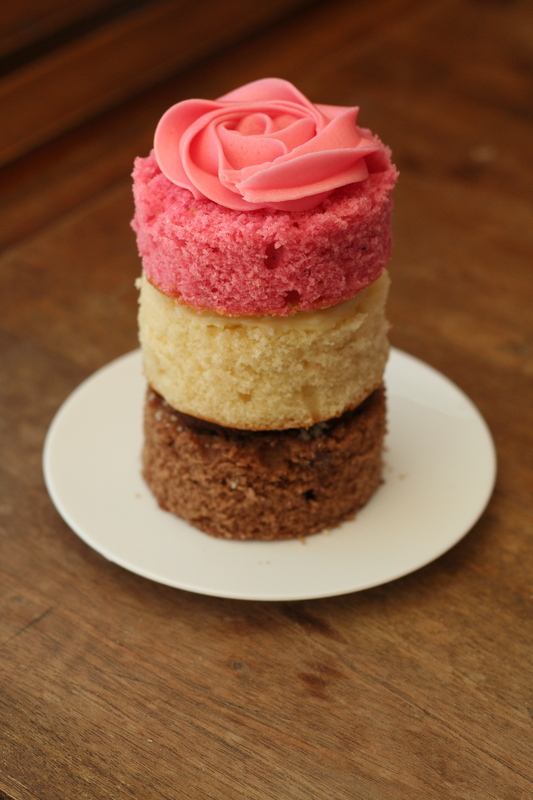 Stack each cake with corresponding frostings in between and finish with a frosting swirl on top. Melt the butter and chocolate in a large bowl over a pan of simmering water. Allow to cool slightly before adding the sour cream and stirring through. 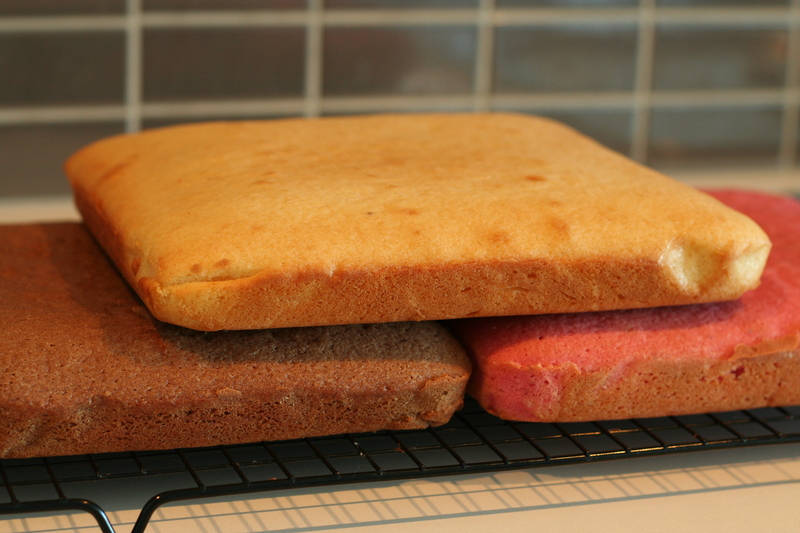 Gradually add the icing sugar and beat well until the frosting is smooth. 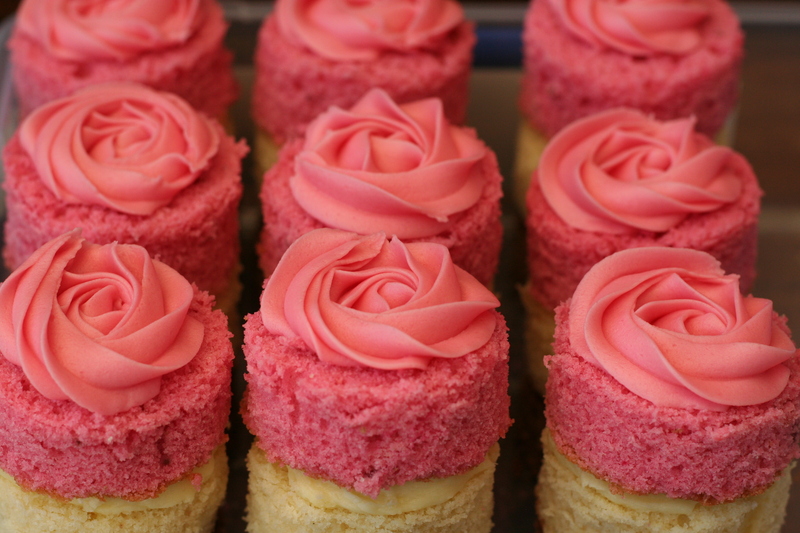 Split the frosting in to two bowls and add a teaspoon of vanilla essence to one and ½ tsp strawberry essence + a couple of drops of pink food dye to the other. As for basic frosting above but substitute in dark chocolate for the white chocolate. This frosting can be quite thick so add a splash of milk if required. Ooh, I will have to bookmark the recipe for Sour Cream frosting. 🙂 I am hoping to experiment making pyrogy cupcakes, topped with sour cream and caramelized bacon bits. Thanks for sharing! These are freekin’ delightful and AMAZING shots. So good! I always hated the chocolate part of Neapolitan and ate around it. But I think this is enough to turn me! That looks amazing! Love the rose topper, such talent! So cute! These look really good! What an awesome idea! Wow! These are soooo beautiful! Your photos (and your piping skills!) never cease to amaze me. The neapolitan combination has been on my mind lately, so I’m very happy to see it made real by you. What a lovely post! Hi! I just wanted to let you know you won this month’s A Lot On Your Plate bake-off! To check out your winning post, go to http://www.alotonyourplate.com/and-the-winner-of-a-lot-on-your-plates-cake-bake-off-is-guest-post/! Very cute, congratulations on winning the bake-off!